Rajdeep Sardesai has managed to take space in this blog many times in the past. Albeit for all the wrong reasons. But that is the beauty with this man. He simply can’t sleep if he doesn’t prove, at least once every week, how big a leftist moron he is and how much intellectually bankrupt he is. Though this sleeplessness is quite routine to him, he generally becomes more sleepless than usual at the start of the festive seasons. Perhaps to make a statement on how an eco-friendly Ganapati is the need of the hour or that noise less Diwali nonsense. It is a different matter that, during the same period he never utters a single word about bloodless Bakrid or tree less Christmas. But then he is a category 1 presstitute so that should be fine. Sticking to his usual half-baked gibberish, RS tried to skirt nonsense from thin air again when he wrote an open letter to Maharashtra CM about meat ban among many other things. Public participation in governance is a welcome thing but not with jerks who have an agenda which makes them see only what they want to see or write. It is time morons like RS are replied with adequate wrath before it gets too late and lies appear as truth. Let’s see how RS fairs here. After two paragraph long hypocrisy in the form of some false praise for Devendra Fadnavis like a typical charlatan, RS goes into his sullying avatar of agenda manufacturing. He writes..
Just take three recent decisions of your government. First, the ill-advised decision to ban meat in Mumbai for four days. Yes, similar attempts to ban the sale of meat during the Jain Paryushan festival have been made in the past by your predecessors but your government tried to widen its ambit to well beyond the Mumbai suburb of Mira-Bhayandar. Ill-advised decision says the moron. But little did RS know that government decisions come in the form of circulars. Can RS show a single circular that has come from the Maharashtra government with regards to this particular meat ban? Last time I checked with Maha government, there wasn’t a single circular issued, either for or against the meat ban during Jain festival. So where was the decision to begin with, much less ill-advised? But that is the problem with all leftist morons like RS. They simply hate BJP because they have this illusion that BJP represents Hindus. So here is the fact. It is in 2004 that the then Congress government closed down slaughter houses during the Jain festival. Many municipalities including Mira-Bhayandar extended it by their own independent resolutions for a week to ten days. And this so called ban is prevailing since 1994. 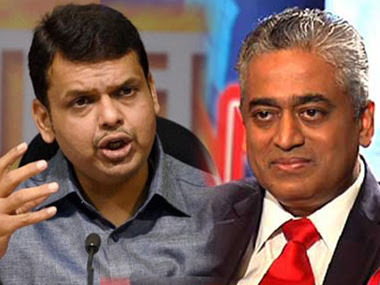 Where was Rajdeep Sardesai till now? Was he nursing his moronic ideas of BJP bashing or the pseudo secular avatar of the then Congress government was too pious for scoundrels like RS to bark otherwise? I never heard RS shouting and accusing the Congress-NCP government of ill-advised decision. Now that there is a BJP government, the secular moron in RS wakes up from his Old Monk hangover and blabbers around like a clown without a job. Even if for a second we accept, RS is annoyed with banning of meat for genuine reasons then why we should have one on Gandhi Jayanti? If the ban is justified to honour whatever Gandhi stood for then how it is bad if we have some kind of ban to honour the sentiments of many? Have you seen RS or any filthy creature from his brethren shouting against Gandhi Jayanti meat ban? Rascals like RS were fine with Gandhi Jayanti ban or the Mumbai meat ban since 1994 because it was suiting their agenda. Now they suddenly got a pinch on their posteriors because a BJP government is in power. To shout now is part of that very agenda again and morons like RS only know too well that unless the pseudo secular gang is back on power their irrelevance in public and political discourse would be permanent. Never mind. Lets move on. The great RS goes ahead and writes about Maria’s transfer and some murder case that shouldn’t have been there in the discussion. We will get to that a little later. But first, a bewildered RS with respect to sedation charges circular of Maha government must be elaborated. Here is what RS has to say. The third perplexing decision taken by your government is its recent circular on guidelines to be followed by the police while making arrests on sedition charges. The circular says “words, signs or representations to be treated as seditious if they are against a person who is shown to be a representative of the government". Does that mean that if I criticise a government minister I will be liable to be charged with sedition? Are we confusing legitimate anti-government criticism with anti-national activity? Again a half-baked diatribe from RS without any base. And I don’t want to believe that this is an honest mistake by RS because it looks whole lot intentional. A circular is not always a decision of the state government. Time and again, circulars are issued to convey the decision of some other authorities, be it the centre or our courts. But a moron only sees what he wants to see. During the misrule of Congress-NCP government an affidavit was filed in Mumbai high court to look at the possible option of attaching a sedation charge for defamatory posts in social networks. Now the high court delivered their judgment and asked the state government to pass it on to the enforcing authorities. Was RS unaware of this development or intentionally displayed his moroniry? As I said, I don’t want to believe RS was unaware of it. With all his flaws a street thug like RS knows very well on what he is doing. It is only the selective amnesia coupled with easy money that refrained RS from barking when the then Congress-NCP government filed this affidavit at the first place. Now that the judgment has come and the state government is following court orders, the great RS again got his posterior pinched badly. In case of Congress the affidavit was aimed at protecting the Chinese Gandhis so RS was OK with the developments and now that the judgment could protect Narendra Modi from Madison Square Garden fame thugs like RS, it becomes problematic all of a sudden. But this is not new. As long as pseudo secularism was upheld and dogs on the street were kept well fed in the name of it, there was no barking. Now that the wheels have turned and the barking lot is only left to fight like cocaine inebriated ruffians in front of MSG, the howling has started from different quarters and that too without any fact checking. RS then jumps to his pet project of being a Rudali for anything that can be used against BJP. This time it is the farmers of Maharashtra. These controversies have shadowed what should really be the single-minded focus of your government at the moment: alleviating agrarian distress in large parts of the state. First, it was Vidarbha; now Marathwada is staring at drought-like conditions. More than 600 farmers have committed suicide since January this year after successive failed crops. Drinking water is scarcely available and the tanker mafias are holding sway. Farmers can’t even sell their ageing cattle because of the ill-conceived beef ban. It may be in RS’s skewed world but I am not going to believe that the farmers got poor in last one year only. If the farmers have plight then the plight has a long history. Strangely I never saw RS questioning his masters in Congress for systematically sabotaging our farm sector for decades. RS promptly furnishes 600 as a number but forgets to mention the 45000 that died during Congress-NCP 15 year loot. Has anyone seen RS shouting for those 45000 ever? I haven’t at least. Congress-NCP spent close to 70000 crore on irrigation projects and most of it was looted as if it is free money but RS only finds problem with the current dispensation. For once, I never found RS complaining the loot back then. Was he being paid with his share in the loot? This is the same RS who was urging people to forgive Ajit Power for his peeing in the dams comment because RS saw a repenting AP later. How absurd this is on the part of a moron who finds the farmers as his Annadata? Wasn’t he seeing the dying farmers then and how Ajit Power mocked their situation of no water with his peeing qualities? Where were RS’s concerns for the farmers when in a discussion he was busy defending the scoundrels of the then government who were nonchalantly shedding off their responsibilities on the operation team of the state PWD department? I never saw a barking RS but rather found him celebrating with Ajit Pawar on his electoral victory, as early as May 2014. Why woke up now? Sudden bout of morality through backdoor? RS is ok with the mess that Congress piled on our agriculture sector but seems to have all the problems now and expects the mess to be cleared like magic. I even doubt if RS would be knowing something called Jalyukta Shivar Yojana of the Maha government and the impact of the same in just about six months. He may not be knowing because he didn’t want to know. He didn’t want to know because of two reasons – first, it would go against his agenda and second, who the hell remembers a scheme when it is not Rajeev Gandhi Jal Yojana for example. And as it is, not knowing the good things of BJP always helps our secular frauds. Coming back to Sheena Bora murder; Rakesh Maria is the kind of self-assassination that RS should have refrained from. At one point he advices Maha government to let go such minor things and concentrate on bigger issues like rehabilitating the likes of Robert Vadra, I mean small farmers, while at the same time he finds it important enough to pop up this point amongst other serious topics. Who made a simple honour killing of Arushi a national news? Who made this Sheena Bora murder case appear as if the worst thing that happened to India in last century? These morons run around naked and shove their mikes on anyone for cheap sound bites and then turn back and say, the matter is silly. Irony, while the entire world except morons like RS knows which exactly the silly things are, we have these jerks routinely stand up and educate us on veracity of the event that needs attention. By the way, had anyone seen RS barking for the 300 odd transfers made both at the state and centre level to defend the Congress party and the culprits in CWG scam? Have you seen RS wasting rims of paper in criticizing the 23 bureaucratic changes to defend the Chinese Gandhis in National Herald case? Have you seen RS jerking off in public in case of Khemka’s transfer for opposing Damad’s loot? Was RS seen tearing off his Kurta for the suspension of that vigilant cop who stopped Vadra’s motorcycle rally in Amethi for lack of proper permission? You may not have because RS goes to hibernation when it doesn’t suit his leftist agendas. Since all mentioned events are in pursuit of upholding our version of secularism and committed by the most secular party of the world, for which RS routinely plays the role of a doormat, RS having temporary memory loss is on the prescribed lines. By the way, Rakesh Maria’s transfer was scheduled and the post was decided at least two months back and there are enough official documents to prove that. Hope the moron-shree Rajdeep Sardesai can now sleep peacefully.